I gasped last night when I went to the ESPN website and saw the headline that Muhammad Ali was dead. I gasped, even though Ali has been dying of Parkinson’s for at least 20 years and even though when he entered the hospital a few days ago, reports were clear that he was probably nearing the end. Another reason Ali’s death hit me hard is I have a long personal history with him. Oh, it’s all one sided. I only met him once — long after his mind had turned to mush and he was barely able to communicate. The crux of our “relationship” is that he and I were Louisvillians, growing up about the same time (he was four years older than I) in the same segregated southern city and taking baby steps that led to awareness of a world outside Louisville. Ali was a special person, of course, but to Louisvillians — again, especially those growing up in his era — he was extra special. Many of us baby-boomer Louisvillians started watching Ali when he was a teenage amateur boxer. A police officer named Joe Martin had a boxing club in Louisville. Martin recruited inner-city kids, with the idea of giving them a leg up, and taught them how to box. One day a kid named Cassius Clay wandered into Martin’s gym, and from the outset, with his speed and reflexes, Clay exhibited special skills. Martin did such a good job with his gym that one of the local TV channels — either WAVE, the NBC affiliate, or WHAS, the CBS affiliate — began televising a weekly boxing show called “Tomorrow’s Champions.” At the time, no one in Louisville gave a thought to the significance of that name. It was just an entertaining boxing show. “Tomorrow’s Champions” ran for either half an hour or an hour, and it featured three-round matches. Like many of my friends, I watched it religiously. It was always special when Clay fought — and he fought a lot and always won. I think the only guy who ever beat him locally was a boxer named Jimmy Ellis, who, like Ali, went on to win the world heavyweight championship at one point. Back then, and still to a large degree, almost all black people lived in “the West End,” with downtown standing as a bulwark between east and west. I grew up in “the Highlands,” in east Louisville, and I seldom ventured more than a few blocks west of downtown. That’s the way it was with most of us from the East End. Cassius, of course, lived in the West End, and none of us East End residents knew much about him outside of his “Tomorrow’s Champions” appearances. I learned much later that for a time, when he was a teenager, he worked part time at the downtown Catherine Spalding College library, where my stepmother was head librarian for many years. She said he was unfailingly courteous, friendly and a good worker. Before the Feb. 25, 1964, fight in Miami Beach, we in Louisville were tremendously excited, but, like many other people around the nation, we feared Liston might not only knock out Clay in the first or second round but might seriously injure or even kill him. Those were the early days of closed-circuit TV, and along with several thousand other people I watched the bout at the Louisville Armory, which also was downtown and where, three months later, my all-boys Catholic high school would hold its graduation ceremony. All of us were relieved when Clay survived the first round, and we became hopeful when it appeared his game plan — keeping his distance from the hulking Liston, dancing around on his toes and peppering Liston with lightning-fast left jabs — might lead to victory. Hanging on very twist and turn of the fight, we endured a torturous fifth round after a caustic substance — perhaps from Liston’s gloves — got in Clay’s eyes and forced him to run around the ring for the duration of Round 5, keeping his distance from Liston. Later, Clay said he only saw Liston as a shadow in the fifth round. 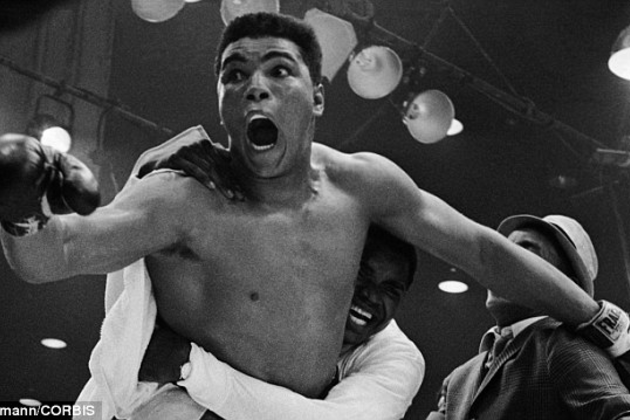 Cassius Clay, reacting to Sonny Liston’s failure to emerge for Round 7 in their heavyweight championship fight Feb. 25, 1964, in Miami Beach. Clay regained command of the fight in Round 6, and, to the utter disbelief of us in the Armory, when the bell rang for the start of Round 7, Liston did not get off his stool. Just sat there, frustrated, disheartened and maybe suffering from a shoulder injury. The referee waved his arms, signaling that the fight was over, and just like that, Clay was the new heavyweight champion…We in the Armory erupted in delirious disbelief…It was, by far, the greatest thrill of my life up to that point, and it might still rank as the greatest thrill of my life. …Fast forward to several years ago, when Ali appeared at the Muhammad Ali Center in downtown Louisville. I was in town at the time, and my good friend Bill Russell and I decided to go to the event. Ali was seated in a big chair, and each person in attendance had the opportunity to approach him, say a few words and have his or her photo taken with Ali. When I got my turn, I wasn’t the least bit interested in a photo; I just wanted to tell him I had been there, in Louisville, that night in 1964, watching on closed-circuit TV. His mind addled by Parkinson’s, Ali stared straight ahead. As I prattled on, he never looked at me, just grunted once or twice. After 15 seconds or so, as I was still talking, a line attendant came up and shooed me on; the next person in line was waiting to pay his or her respects to what amounted to a statue of a man. Leaving the center, I was glad to have been within a few feet of Ali but disappointed he apparently hadn’t understand a thing I had said or realized how much that night meant to me. Was your friend THE Bill Russell of basketball fame? Thanks, Laura…No my friend Bill Russell is a relatively short white guy from Pee Wee Valley, KY, just outside Louisville. He moved “into town” when he was in fourth grade, and we’ve been close friends ever since. The crime is that at the very height of his career he was not allowed to fight owing to his opposition to government foreign policy. Excellent tribute, Fitz. And a wonderful insight to how Ali impacted those from his hometown. Nice piece, Jim. Your passion for the man and the memories shines through. One of our cable channels runs old Tonight shows, and it could not have been coincidence that one of the guests last night was Muhammad Ali. He was 35 at the time and was on to promote his movie. Very nostalgic to see both him and Carson. Like Ali, Carson was “the greatest of all time” in his chosen field.